During a soccer game, Carter Bartonek hands the ball to a player to throw in bounds. This was the third day of games for the soccer season, and Bartonek had reffed six games by now. 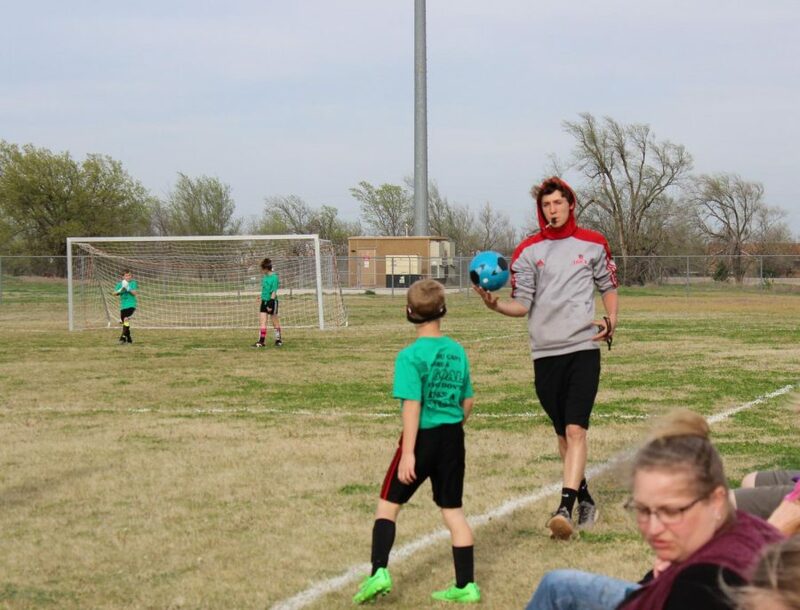 For the past two years, Conway Springs Rec Center has put on a spring soccer season for pre-K students up to sixth graders. Teams are split by age group: pre-K and kindergarten together; first, second and third; and fourth, fifth, and sixth. Usually the season is during March, but with the past years being cold and dreary, the Rec decided to change the season to being in April. During this season, high school students have the opportunity to ref the games. Refs help set the games up by making sure the goals are in place and both teams are present and ready to play. The people who ref receive 20 dollars per game, but they don’t receive the money until the end of the season. Bartonek, on the other hand, does not take the money. Because the season is made up of children who are just starting out, reffing isn’t that intense, Bartonek said. For the youngest group, only the basics of out of bounds are called. As the age groups progress though, more violations are called. Bartonek primarily refs for the fifth and sixth graders since he himself plays soccer for a club team and really understands the game. This is also why he plans to stick to reffing just soccer, not softball or basketball.